Before you get the wrong impression about my social media engagement experience, I’ve been using social media for more than two months. My first personal status update on Facebook was on 26 October 2006. My first tweet was on 18 April 2008. And I got an early invitation to Google+, so I was on it before the public release: 30 June 2011 (the public launch was in September). We won’t talk about MySpace, but I was on that for a bit before Facebook came along. In contrast, Ardea Coaching as a brand page has only two months of data on these “big three” social sites. That gives me some insight into what new businesses confront when they’re just getting started. Caveat: Is Social Media Engagement Right For You? From my perspective, interaction is good. For Ardea, I look at it this way: for every interaction, even if it’s a simple +1 on Google Plus or a Like on a Facebook post, there’s a person who is indicating they’re more interested in what I do than all the (let’s face it) millions of people who didn’t take the time to click that button. They’re that much closer to referring business to me, or signing up for a class, or writing a recommendation, or asking for a proposal. Therefore, I find interaction one way to pre-qualify leads. Note that although I did start my G+ and Twitter accounts earlier than FB, I gathered data starting July 7th, my first official day of relaunching Ardea. As mentioned in a social media post recently (Google+, Facebook, Twitter), my follower growth has been fastest on G+ by a fairly wide margin. An endorsement is the term I’m using for the lowest-commitment social media engagement on the big three sites: a Like on Facebook, a favorite (the star) on Twitter, or a +1 on Google Plus. It’s an interaction, so it shows interest, but not much more. I compared the total of all endorsements, as well as endorsements-per-post to see where I got the most interaction; there wasn’t too much difference by percentage. 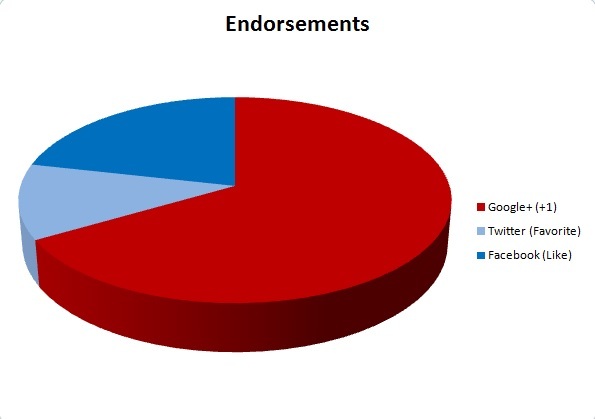 The chart below shows percentages by total endorsements. By per-post, Facebook gained about 8 percentage points and the other two showed roughly proportional decreases, so the chart looked similar enough I didn’t include it here. This is the next level up, in my opinion. If someone comments on a post, or mentions you in one of theirs (or in another comment, or whatever), we’re talking about that portion of your audience who has risen above the single, easy, one-button click to actually typing things like words or even sentences. Sure, occasionally it’s not more than “LOL” but usually there’s more thought, time, and effort expended on the part of the audience member. Like with engagements, I looked at totals and per-post averages. On a percent basis the two were even closer (Facebook gained only 4% share), so again only one chart. Note that Twitter might be so big because of a disproportionately long conversation with Danny Wong sparked by my earlier blog post riffing off one of his articles. His comments were about a third of all the Twitter mentions. And because only Legolas’ elf eyes would be able to discern the difference in the chart, Google Plus is at 48.3% and Twitter is second at 46.7%. You should note something else here, too. Above, I linked to my social media posts about follower growth. The people who commented on that post in G+ were industry leaders. I’d consider Danny Wong to be an influencer or “big name” (big enough that I’m happy to have received so many mentions by him on Twitter). 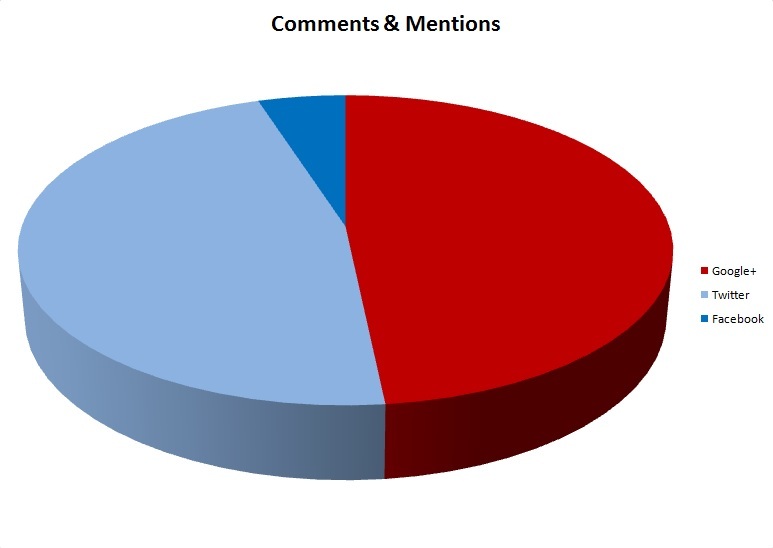 In comparison, 100% of the comments on Facebook were made by myself (replies, follow-up information, etc.) or by people that I already know in my day-to-day life. In other words, from a quality standpoint, Twitter and Google Plus are delivering interaction and connection with new and influential people. They are delivering high volume. In comparison, Facebook is low volume connection with people I already know. That’s not to say the Facebook comments aren’t from quality people, rather, that I can connect with all those people without ever using Facebook. Here’s the gold medal level of interaction. A share is love. 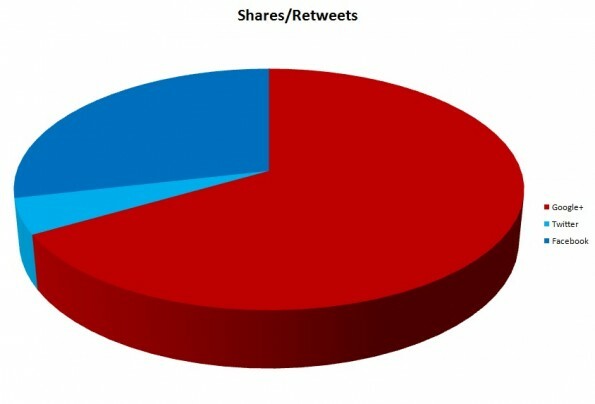 A share is required for “going viral.” A share is, to use Seth Godin’s terms, a “sneeze” that passes on the “ideavirus.” It’s what exposes new people to your brand, your services, your marketing messages. It’s an advertisement, a recommendation, and an endorsement all wrapped into one. The note here is mainly that I specifically asked people on Facebook to share, whereas I didn’t on either G+ or Twitter. I was trying to get a minimum number of followers on Facebook so that they would give me stats about my page (a requirement the other two sites don’t have and, even if the rule applied to all three, wouldn’t have been a problem). Again, there wasn’t much shift between totals and shares-per-post; the difference is more or less the same as I described in “Endorsements,” above. Based on my own pages’ data, it’s pretty clear that from both a quality and a quantity standpoint, Google+ is the big winner. It takes the top spot in all three areas in both total numbers and per-post averages. Twitter still provided me with better visibility by and connection to new people than Facebook, even though it came in last in two of the areas. Facebook only really supplied me with connections to people I already know, and only after I made the ask of my contacts. If this seems like I’m bashing Facebook, I’m not. If I wanted to concentrate my marketing on my friends and family, it would have come out on top (remember, “what’s your goal?”). There are, however, many people who think being on Facebook with their business is the best thing they can do online. My intent is to show those people that they should probably explore more sites as part of their online marketing strategy. It’s particularly true if interaction with new and influential people is important to them. Finally, the Twitter comments example shows that sometimes the needle moves in a big way because of some chance, serendipitous conversation. Have you seen measurable success on Facebook relative to other sites? Or are you seeing the same trend I am? I’d love to hear your stories in the comments below, or on one of these social media sites!